Fleas are insects 1/16 to 1/8-inch long that are very agile, usually dark colored, with tube-like mouth-parts used to penetrate the skin and feed on the blood of their hosts. Their bodies flattened vertically, so they can move easily through the hairs or on the host’s body (or in the case of humans, under clothing). The flea body is hard, slippery, and covered with many hairs directed backward, which helps its movements on the host. The tough body is able to withstand great pressure, likely an adaptation to survive attempts to eliminate them by mashing or scratching. Even forcibly squeezing between the fingers is normally insufficient to kill a flea. 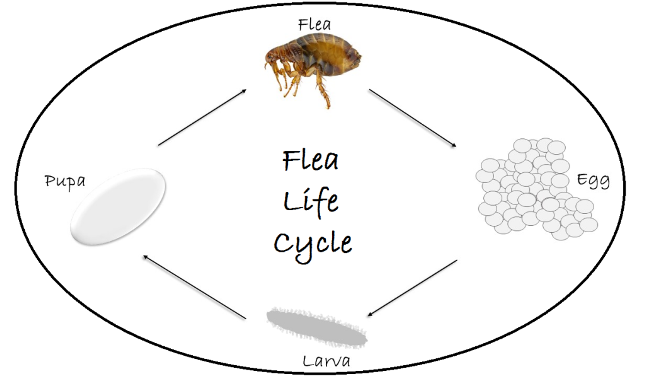 The flea life cycle consists of four stages: egg, larva, pupa, and adult. Adult fleas must feed on blood before they can become capable of reproduction. The flea life cycle begins when the female lays eggs after feeding on a blood source, usually that blood source is you or your pet. Eggs are laid in batches, usually directly on you or your pet, which means that the eggs can easily roll onto the ground. Because of this, areas where the host rests and sleeps, like your bed or your pets’ bed, are primary infestation points. Flea larvae emerge from the eggs and eat any organic material such as dead insects, flea feces, and vegetable matter. Given enough food, larvae will pupate and weave a cocoon within 1 to 2 weeks. After another couple of weeks, the adult flea is fully developed and ready to leave the cocoon. They may however remain resting during this period until a host is near – vibrations (including sound), heat, and carbon dioxide are indicators of the probable presence of a host. Fleas are also able to overwinter in the larval or pupal stages. Once the flea reaches adulthood, its primary goal is to find blood and then to reproduce. Finding blood means that you and/or your pets is getting bit. Adult fleas only have about a week to find food once they emerge, but after that they can survive for extremely long periods of time between meals (some studies estimate up to 2 years). Flea populations are evenly distributed, with about 50% eggs, 35% larvae, 10% pupae, and 5% adults. This population distribution is one of the keys to efficient flea control; all stages must be treated to fully exterminate the flea. Their total life span can be as short as one year, but may be several years in ideal conditions. Female fleas can lay 5000 or more eggs over their life, allowing for phenomenal growth rates. Fleas are not only common in Portland Or and Vancouver Wa, but all over the states. Fleas are not only annoying to everyone; mainly because of the itchy bites they leave behind from feeding on your blood. They are also capable of spreading disease and other parasites. Fleas are responsible for spreading bubonic plaque and also the source of parasitic worm infestations in people and pets. Fleas are very hardy insects and have adapted well for survival. 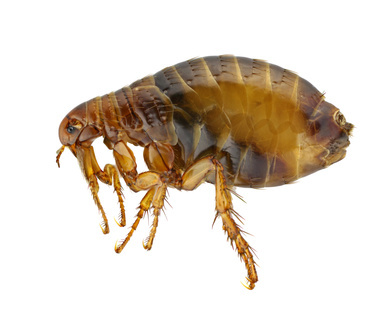 Once fleas have established themselves in your home they are EVERYWHERE; your bedding, your pets bedding, carpet, furniture, all the crevices and cracks around your base boards even out in your yard. Proper flea extermination requires addressing each stage of the flea life cycle in different manners. Bloom Pest Control is very effective at flea extermination and flea control. We know where they live and how they think! We not only kill fleas with our proven methods, we also insure your problem doesn’t come back with our flea control management. Our professional pest control technicians excel at ridding your home or business of fleas. Give us a call or use the handy online form below to get started on the road to pet and family friendly flea extermination. Bloom Pest Control serves the Portland, Oregon and Vancouver Washington metro areas.